Business Manager for Sunderland Care and Support. Owen Murray has been delivering a range of training programmes for our company for five years. Sunderland Care and Support is a Local Authority Trading Company and are a large Care Provider with around 1100 employees. We support vulnerable adults known as customers across a range of services. Many of our customers have learning disabilities and/or mental health needs and have sometimes lived in hospital for a lot of years. The staff work with the customers to promote independence, choice and control however they can often be faced with managing behaviours of concern. The Company therefore set out a workforce strategy in the area of Prevent and Protect. Owen helped us to achieve the outcomes and delivered the following training courses for us. PMVA Physical Intervention Training (3 days annual refresher) to employees who had completed the 5 days initially. Breakaway Refresher Training – For the group of Trained Trainers on an annual basis. Owen has many years of experience and is trained using the General Standards Framework. He attends refresher training himself in line with the standards. Owen has also delivered customer centred sessions with teams who may be struggling with a particular situation and further skill and consistency was required. Following the Train the Trainer Programmes Owen was available for advice and would attend meetings or visit establishments if required. He made a recording of the techniques so that the Managers could check visually if they needed to. Owen was always vigilant in relation to H&S checks and making sure that the space available, quality mats, room temperature etc.. was suitable for the training. He ensured that he met with each individual before the training started to go through a health questionnaire and to reassure, advise anyone who needed this. He would also keep checking on everyone’s wellbeing as he delivered the course. Owen always gave out an evaluation form to participants at the end of the course and over the years the feedback from this training has been excellent. As a company we monitor incidents and keep a spread sheet in relation to anyone requiring any form of restraint. The figures have considerably reduced and I feel this is a lot to do with the good training, advice and coaching from Owen. As a company we are also delivering training in Positive Behavioural Support and Active Support alongside the above programmes. “ I just wanted to say how very well the course was facilitated, I have done PVMA for several years (13yrs) but due to a back injury I have not been able to complete full PVMA. The Breakaway Course was in my opinion excellent, I learnt so much and honestly thought I knew a lot with supporting adults with behaviours that can challenge us for around 16 yrs, I found the instructions and commands of the course very clear and understandable, I didn’t want it to end. One of the values in our company is ‘Customer Focus’ and Owen has contributed to this value, which is greatly appreciated. Photos from a recent event at Stoke Mandeville Hospital in Aylesbury, England. Northumbria URNU members were very honoured to have Owen Murray M.B.E 6th Dan come in as a favour to his comrade in karate Colour Sergeant Mick O’Donnell to give them a talk during Drill Night. A very charismatic character that led a particularly colourful life, his relaxed style of talk captured the attention of the Unit as he described his journey from losing his hand at an early age in a factory accident, through to a distinguished career representing Great Britain in the Karate squad and has been a member of KUGB for 44 years and started his own self defence company alongside numerous other ventures. With the aid of some pictures on a slide-show, Owen led the Unit through the trauma of losing his hand as a young man in a factory accident, the injury exaggerating an already shy persona. However Owen made it abundantly clear that after a short stint of alcoholism directly after the incident, his life altered dramatically after beginning Karate training. Setting a standard that remained through his life, after asking an instructor at his first training session, “Is it a problem for you?” holding up his prosthetic arm and receiving a resounding “no”, Owen demonstrated that he was just as able in fact more so than most people. “No one saw Owen as being disabled because no allowance was made for it.”John Holdworth, his first instructor. Owen's passion for Karate and self defence was obvious. 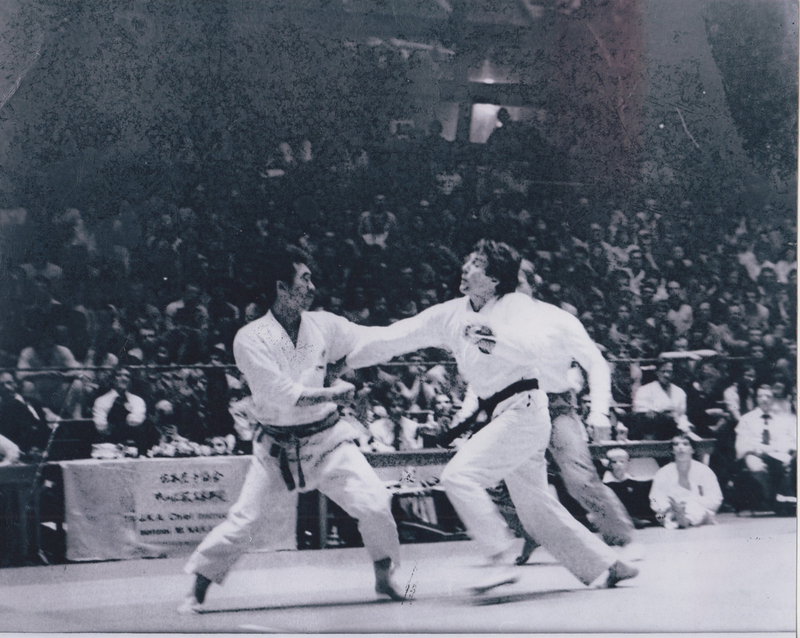 Humbly detailing his achievements that include winning gold at European championships, and captaining the team that won gold at the British Championships amongst many, he was clearly at the top of his game. By this point you had to remind yourself that this champion was short of a hand. It put any of your own ailments firmly into perspective, particularly as Owen talked of how intense his training regime was, the amount of students who tried and failed to keep up with him as he trained relentlessly numbered many, whilst those who stuck it out, including our COXN were the few to make the elite team that Owen selected for Sunderland and Team GB. Even now Owen's training regime of sixty sit ups and twenty press ups ten times a day as well as his normal training is intimidating. However it was made evident by the detail with which Owen talked about his various team mates that he respected all of them, as they shared his passion, and despite his very obvious success, had remained very humble and down to earth. Whilst it was karate that gave Owen the confidence and fine tuned his fighting spirit, he put his fight to good use in other areas; a surprising twist to his talk was about his trip to Sierra Leone. Travelling to Sierra Leone in February 1993 to join Paul Jenkins, a member of Newcastle Dojo to assist him in charity work. It was news to Owen to discover that he had gone to volunteer in a country that was in the midst of a violent civil war as he had agreed and set off on good will. Owen spoke vividly about the shocking poverty which these civilians lived in, life expectancy was down to 42 years, people were visible starving, polio was rampant as there were very few safe supplies of drinking water and there wasn’t even an electricity supply to Freetown. However Owen focused on the positives of his time with the Christian Brothers, which included teaching karate at the dojo there, creating some stability and giving some discipline to the youngsters in the area in particular. This stability and safety his teaching provided was sorely needed, one of Owen's most chilling tales was about a young man, who after witnessing his classmates beheading by guerrilla fighters, retrieved the head, kept it, and turned it into a lamp. A shocking memory for any crowd. His experiences with the Christian Brotherhood also brought him into contact with Brother Sneider, a German limb maker, who’d spent 18 years there making wooden limbs for the many polio victims and lepers. This led Owen to talk avidly about the children he had encountered at Freetown Cheshire Home, who had been disabled by Polio, yet they were still playing football and amazed by the fact a white man could be disabled also. Whilst Owen had clearly spread himself very thin, describing that his work rate, lack of food and water and extreme heat rendered him very ill on multiple occasions, he had remained dedicated to his students and lead them through multiple grading during his time there. It was clear that Owen’s time in Sierra Leone had a profound impact on him. In his typically laid back manner, Owen downplayed all the charity work he had done over the years, both individually and as part of his company Remploy. One particularly awe inspiring method of fundraising was doing 3,760 sit ups in an hour outside a pub to raise money for a friend at another dojo who had cancer. This was one event in many that displayed Owen's enthusiasm for a challenge, particularly if it was for a good cause. 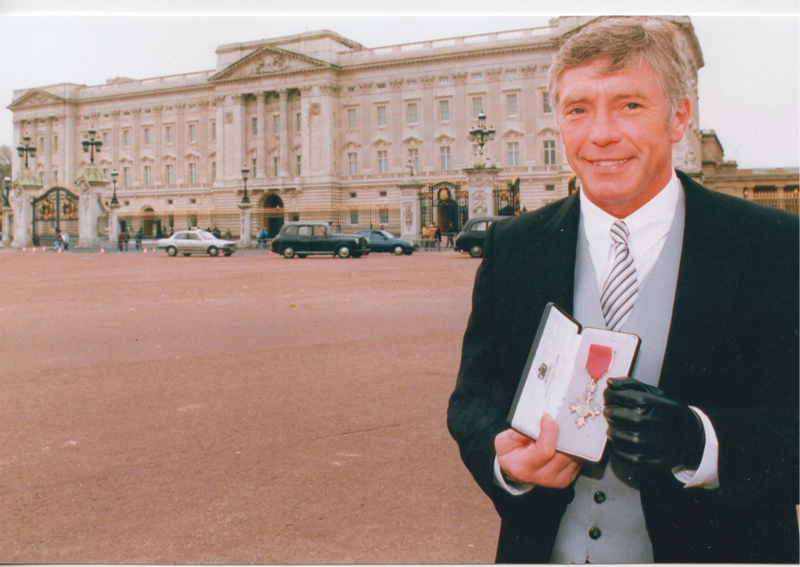 After many years of fundraising, Owen was awarded and M.B.E was his services to the disabled in 1994, he recalled with good humour about how the Queen pushed his hand away after pinning his medal on as a method of keeping schedule. Fortunately we were able to see this as Owen had a video, as he hailed this understandably as one of his proudest moments. It was just karate and charity that Owen has succeeded in however, after working at Remploy for many years, alongside being the security for multiple Sunderland clubs, he set up his business Sure Safe in 1996. This company uses all of Owen's skills, teaching self defence in a practical manner to individuals and businesses. As some students later encountered as they were volunteered to participate in examples in the bar afterwards, Owen combines his skills at de-escalating a situation verbally whilst using his karate skills in a practical manner to deal with some very real life situations. His teaching style was very motivating and no-nonsense, but all the students left with a better knowledge of how to handle themselves than what they’d arrived with. Throughout his talk, Owen welcomed the NURNU members to get involved and ask questions, of which there many, ranging from how he had first coped with losing his hand, if he would return to Sierra Leone, down to what was your proudest victory in karate, he answered all of them with real honesty and humour, making it hard to believe that this was a man who wasn’t keen on public speaking. We at Northumbria URNU were very grateful to Owen for coming in to talk to us, sharing his interesting and inspiring experiences, leaving us with an impression that if you’ve got enough fight in your belly there’s only your own discipline and work ethic standing in your way. That and you should always have another beer, even if you’re about to crack out close to 3760 sit ups outside the pub. Much obliged to Owen Murray and we hope to host you back at HMS Calliope in the near future. We recently ran a course at Conyers School in Stockton-on-Tees. Here is some of the feedback ! "I can't believe how useful it was. I came along to have a laugh but it really made me realise how vulnerable I was and how, if under attack - I would do all the wrong things! A really valuable session. Thanks Owen!" "I would recommend this for all college students. Fantastic day!" "Absolutely brilliant day. I've already practiced it at home on all my family members!" Latest Update January 27th 2016. We have successfully delivered more training to Sunderland Care & Support please see below some of the very positive feedback we received. "I felt everything we learnt was done very thoroughly, having only 6 people on the course was beneficial. I have trained for 9 years and this has been the best course I have ever been trained on"
"I have gained more experience and understood better than other courses of the same kind in the past"
"Friendly, relaxed attitude, did not condisend if I was not doing things right he would help me"
"This course has been the best and most relevant in the twenty years I have been in this employment"
"Owen was an excellent tutor. Everything was covered with patience and professionalism. Enjoyable and informative"
"Best! PMVA course I have been on. Tutor learnt me a lot of theory and practical skills to take back to my workplace. Thank you Owen"
"Has a lot of knowledge & experience. Ensured all took part, was sensitive to peoples confidence & abilities, pitched it well"
"Excellent knowledge, professional, knows his stuff"
Owen is professional, he quickly builds up an excellent relationship with the class"
"Very Interesting course. Owen has a skill at keeping people focused and interested. Very enjoyable"
"Very good tutor knowledge, excellent understanding re company Care and Support. Excellent"
"Owen is excellent in his timings and I have left feeling updated and more confident in improving my skills when delivering breakaway training"
"Professional and also friendly and approachable"
"Shows great knowledge in every aspect and all questions answered"
"A lot of opportunities given to ask questions and all questions answered with confidence"
"Very professional and patient attitude"
"Explained to a high level to help learn and remember theoretical issues"
"Everything explained and shown to a high level"
"Practical content met all my needs and more"
"Tutor was more than happy to answer any queries"
"I feel I am going to learn a lot from this course and I am looking forward to the next few weeks." "Found this course very informative but would like the chance to learn more. Owen was a fantastic tutor and made us all feel very comfortable. Hopefully we will get a chance to work with Owen again and learn more." "I enjoyed taking part in the physical activity although I wasn't looking forward to going. Had a good laugh and learnt basic defences which would help me if I had to endure physical abuse towards me. 1st class." "Very much enjoyed the lesson. I feel I would benefit from more lessons as I feel my confidence would grow." "Owen was brilliant with all the girls as we were all different ages, heights and sizes. He took time to explain everything. I felt at ease in his company as did the whole group. I would like to continue and learn more about self defence." We have just recently successfully delivered training to Sunderland Care & Support please see below some of the very positive feedback we received. "The tutors were very good and I really enjoyed the course"
"Course was tutored excellently and kept everyone interested"
"Excellent knowledge and teaching style" - "Very interesting right to the end"
"Very, very knowledgeable couldn't ask for anything more"
"Excellent demonstrations and techniques shown / demonstrated"
"Very relevant, use some techniques frequently"
"Excellent attitude, very open and honest, made to feel comfortable"
"Good information and examples shared"
"The content of the course was good, refreshed my techniques and showed up to date techniques. Found it very valuable to be able to discuss with tutor and be given techniques to use"
We are currently contracted by Sunderland Social Services delivering P.M.V.A (Prevention and Management of Violence and Aggression) . We are the ideal training provider if you are looking for ways to reduce cost on courses that involve various options. Click here to read some of the positive feedback from attendees. We are currently contracted by Cumbria N.H.S Trust delivering P.M.V.A (Prevention and Management of Violence and Aggression). We are currently running courses at various locations this includes Breakaway Training, and as part of the P.M.V.A. (and Breakaway Training) we cover Conflict Management and the use of reasonable force. We are the ideal training provider if you are looking for ways to reduce cost on courses that involve various options. We are delivering training to staff which include dental nurses, physiotherapists, occupational therapists, staff in care homes, staff in mental health units, in patient mental health units, residential care home staff, district nurses, community nurses, paediatric nurses, plus school nurses to name but a few. We can tailor courses to suit the majority of your staff. We have a proven tried and tested formula which we can implement into your organisation. Do you feel your staff have been adequately trained to deal with potentially violent situations? "Excellent course made me aware of my vunerability thus enabling me to take steps to ensure my safety"
"Fantastic delivery. Very well taught, great interacton and practical application. Really enjoyed it"
Brilliant Course. I've learned lots about self defence and didn't realise how open to attack I was"
"Very enjoyable. It will help me in my job as a porter"
"A most worthwhile course, boosts confidence and teaches respect - I will try to endevour not to under-estimate people. I will also request the rest of my staff are allowed to attend"
"Best course I've been on covering this area. Excellent knowlegable Tutor made course interesting. Other breakaway courses do not involve so much practical"
"First class course, please repeat on a regular basis"
"A very relavant and useful course for techniques that can be used in all kinds of day to day events. This would be a good course to use for everyone and would be advantages to do refresher training"
"A great course which we should have had years ago. First class tutors who delivered the course brilliantly. This course would be of great value to many more front line staff enployed by Sunderland Council"
Could your front line staff potentially come into contact with aggressive or potentially aggressive people? Sure Safe gives your staff the skills to be aware of potentially violent situations. If someone does become violent towards your staff it gives them the ability to breakaway and escape without any injuries to a member of the public. Main objective is to get away. Within our society we are all facing the possibility of either verbal or physical abuse either in our working or social environments, and often at times when we least expect it. As individuals, and Employers, we all hope that we will not experience such acts, and as Employers our responsibility extends to all of our staff and employees whilst those individuals are engaged in their everyday duties. We have a legal obligation to ensure as far as possible that our Employees undertake their duties in a safe and secure environment. However, as our working practices have changed in recent years, more and more Employees are required to carry out their duties without the presence and support of another colleague. Examples being social workers, carers for the elderly and infirmed, customer care officers for Housing groups, etc. The list of employees who undertake their duties as single individuals extends significantly beyond the latter examples, and due to the ever changing working practices the number of people whofind themselves in this situation will undoubtedly increase. There are also occasions when an office based Employee may have to meet a member of the public on a one to one basis, and again that Employee may experience either verbal or physical abuse or intimidation from the visiting party even within the office environment.